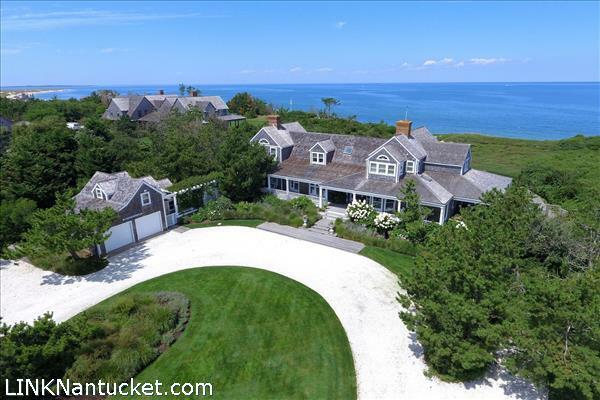 North Shore Waterfront Estate Over looking Nantucket Sound with Private Steps to miles of gorgeous sandy beach that stretches from Brant Point to Eel Point. An outstanding property consisting of a main home with ocean facing in-ground pool, over-sized garage & studio. 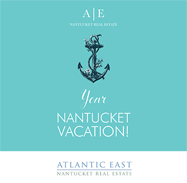 Ideally elevated in the dunes on the North shore of Nantucket Island, enjoy endless water views from nearly every room of the spacious main house which is thoughtfully designed for both relaxed summer living and island entertaining. Sophisticated and comfortable with attention to detail and every amenity; relax and unwind in front of any one of the 4 fireplaces; morning coffee or evening cocktails by the ocean facing in-ground pool; wide porch perfect for summer lunches with an outdoor kitchen and enclosed herb and vegetable garden; wine cellar; a gym; a whole house automated generator; and stunning landscaping with rose covered arbors and native grasses embracing the grounds. The main house has three private bedroom suites; open living and dining area; two studies; a balcony; a lower level family/media room; home gym; wine cellar; well equipped kitchen with space for catering; laundry room and storage area. Attached to the main house via a pergola is the studio with a one bedroom suite above an over sized two car garage and caretaker\’s workshop. Renowned for gentle surf, the North Shore is perfect for swimming, boating, paddle boarding & surf casting – simple summer rituals that recharge and inspire the entire family. Experience downtime where the sky meets the water and magnificent sunsets extend the day. Generous living with muliple windows and stunning sea views, gourmet kitchen with sunny breakfast area, formal dining and guest suite. From the living area you can access the large back deck with seating surrounding the beautiful pool. There are wooden pathways leading through the back gate to private ocean access. Outside the dining room is the outdoor dining and kitchen area. Here is located the kitchen garden protected from deer and rabbits. Every amenity is accounted for, there are 3 fireplaces, a wine cellar, a gym, a kitchen garden of herbs and vegetables for “farm to table” meals, a catering kitchen, an automated generator for security, and stunning landscaping embracing the grounds. Adjoining the house via a pergola is the studio with one bedroom with a sitting area and private bath (shower) above and parking for two cars and storage below. Master bedroom with absolutely stunning ocean views, walk-in closet and changing area and large en-suite bath; a study/home office with ocean views, and another guest suite with ocean views, walk-in closet and private bath. The second floor can be accessed via two stairwells which creates ultimate privacy for each room. The basement houses a lower level TV room/rec room, home gym, wine room, laundry area & loads of storage. There is exterior access as well as the internal staircase. The 2-car garage houses the propane powered generator, ATV Gator and still has storage and room for 2 cars. Above this is a studio with vaulted ceiling, ocean views, and a full bath.